a device used for drawing perspective projections of machine parts, structures, interiors, and so on. 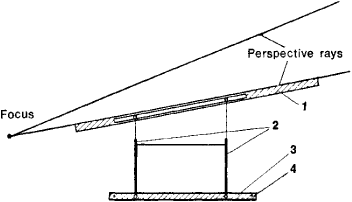 A common type of perspectograph consists of a base straightedge and another straightedge that is mounted on extensible legs with graduations for determining the perspective angle (see Figure 1). The perspectograph is attached to the drawing board with pins. The perspective angle is set—that is, the vanishing points, or foci, are found—by lengthening or shortening one of the legs. The perspectograph permits the draftsman to determine the directions of the lines in the perspective drawing to the right and left vanishing points.